This year at Microsoft Ignite we are excited to share new innovations and capabilities that are helping our customers successfully embrace video for employee engagement, richer communications and a more informed workforce. For companies like Baycare, a not-for-profit system of hospitals and facilities that provide healthcare services, patient health and safety is critical. Video is an integral part of their strategy to educate and train the 25,000 employees who work with patients every day, many of those who spend their time assisting patients in clinics and hospitals, and not sitting behind a desk. Worldwide, general availability of new live event capabilities will begin to roll out later this year in Microsoft 365. Customers can create and stream live and on-demand events in Microsoft Stream, Teams, and Yammer to inform and engage customers and employees, wherever they are. These capabilities are available in preview In Microsoft Stream now – get started using live events for your leadership announcements, training and more today. Now employees can watch videos on the go with the Stream mobile app for Android (available today) and iOS (coming soon), with support for watching live events and viewing videos offline. With the Microsoft Stream mobile app, have all your training, company announcements or meeting recordings at your finger tips. With new meeting recording capabilities in Teams, if you or other invitees miss a meeting you can watch it on demand. Teams recordings use Stream to enable deep search across audio to quickly find keywords or action items that make it fast and easy to gat caught up. Stream is now generally available in Office 365 Business Premium and Business Essentials plans, designed for small and medium sized businesses. Now organizations of all sizes will be able to: securely share and discover videos from across the organization–all in one place; leverage AI to find every keywords and important moments with searchable speech to text and speaker detection; and integrate video seamlessly across apps, including Teams, Yammer, SharePoint & more. Beginning next month, these features will become available in all Office 365 Enterprise, Firstline and education plans. We are looking forward to seeing you at Ignite! Be sure to come by the Microsoft Stream booth in the expo and attend some of the Stream sessions. Great announcements! You and the Stream team are awesome! Can not await the iOS app for viewing videos offline from inside my secured Office365 environment! We need more video content in companies and Stream is the best platform to achieve this! From a developer's point of view, it would be great to have a public API to upload videos automatically to my and other tenants and to be able to approve videos via a workflow before publishing them to others. With that the service would reach the last percent of perfectness for the needs of my customers and me. This is great that we can have engaging communications and empower everyone with transcript search and timecodes! Any chance we could also sort videos by name? Maybe your AI platform will figure it out that sometimes users don't care about relevance, likes or trending and are supposed to watch training videos in order that makes sense. The included tenant storage for Stream, will that increase as it is very limited in comparison to SharePoint storage (and Onedrive)? 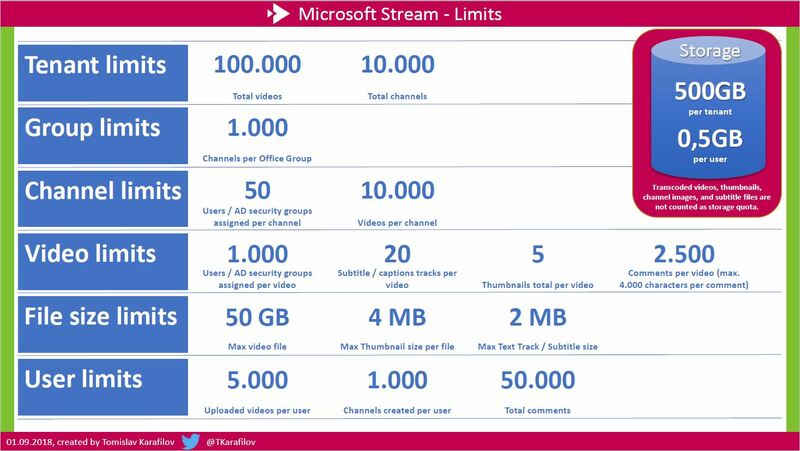 0.5GB/user with Stream vs 10GB/user (+1TB) in SharePoint and almost unlimited in OneDrive? Awesome updates! With the transcription, what about translating it to other languages? Thanks! Are we still waiting on playlists/the ability to sort a list of videos in a preferred order? @Christina Torok- it looks like Microsoft is ignoring all questions about playlist/sort by name functionality. Would it be possible to provide us with a definitive answer? If we cannot have playlists in Stream I need to quickly switch to a different product. @Christina Torok What date will the Live Events feature be released for general availability for o365 customers? iOS app - What happens? At Ignite I got the feeling that the iOS app was "days away". Now it has gone more than a month and there seem to be total radio silence about it.